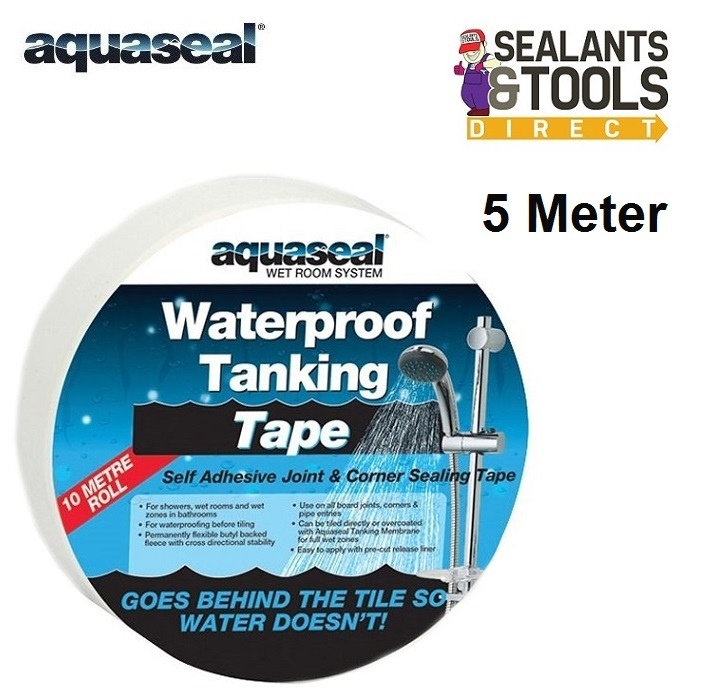 Aquaseal Tanking Tape 5 Meters Reinforcing Tape. 5 Meter Self adhesive butyl backed fleece tape mat. Designed to provide a waterproof seal prior to tiling on board joints, corner joints and pipe entries in shower areas, wet rooms, wet zones and anywhere where a watertight seal to a corner, gap or crack. The unique butyl fleece provides cross directional stability to accommodate board movements occurring in different directions at the same time, essential to provide a permanent watertight seal. Available as a larger size square Drain Mat for standalone showers. On timber and plaster based boards and porous substrates prime using Aquaseal Tanking Primer and allow to dry before applying. Remove the release liner progressively as the tape is applied, smoothing down with a small roller a seam roller is ideal, Take care to avoid rucks in the tape. The liner is pre-cut along the length to allow one side of a corner to be applied and smoothed prior to repeating the process on the other side of the corner. Ensure the tape is pressed carefully into the corner before sticking the other side down to avoid stress on the tape in the corners. When joining the tape, and on internal corners, ensure the tape is over-lapped by at least 50mm onto the next piece.